Red Sanders (Hindi name - Lal Chandan or Raktachandan) is a light-demanding moderate sized tree growing upto 8 m tall with a trunk 50–150 cm diameter. It is fast-growing when young, reaching 5 m tall in three years even on degraded soils. It is not frost tolerant, being killed by temperatures of -1 °C but stays well at semi-arid climatic conditions. 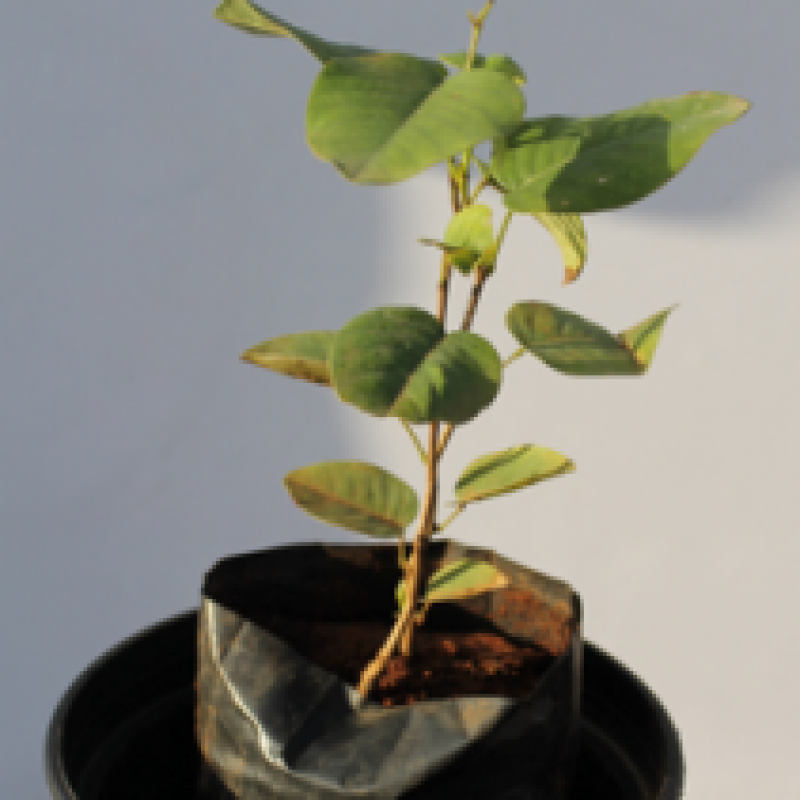 The leaves are alternate, 3–9 cm long, trifoliate with three leaflets. The flowers are produced in short racemes. In Hinduism, this wood has been traditionally used as a sacred wood. The priests and higher class casts such as brahamin extensively use this wood on many of their rituals. It is found mainly in South India, Sri Lanka, and some parts of Nepal and Pakistan. It is observed that the red sanders grown on the shale type of subsoil, at an altitude of 750 meters above sea level. Red sanders with wavy grain margin fetch a higher price than the non-wavy wood. It is used in diseases like cough, vomiting, fever, hyperdipsia, helminthiasis, diseases of the blood and eye, wounds etc. The heartwood and fruits of Rakta chandana have great medicinal value. It reduces the burning sensation, arrests bleeding, alleviates edema and ameliorates various skin disorders, hence, is an effective external application as a paste, in burning sensation, headache, dermatoses and ophthalcopathies. This species is listed as Endangered by the IUCN, because of overexploitation for its timber. Red sandal is one of the finest perfumery materials since ages. The demand for the natural red sandal is increasing faster than of supply. Because of scarcity and supply industries are constrained to use alternates similar to Indian sandal wood, imported from different countries. And its products find use from cradle to cremation in human life. Even Red Sandal wood OIL, because of its unique chemical and physical properties it has acquired a special place in aroma therapy medicine, perfumery, agarbathi, Soaps and Detergents, Pharmaceutical, Cosmetic and allied industries. Naturally grown sandal wood can find in Karnataka, Tamilnadu, Andhra, Kerala, Gujarat, Madhya Pradesh, and U.P. Manipur and in some other states. Red sandal is known all over the world as East Indian Red sandal wood and is prized for its quality of oil and heart wood. Red sandal is also considered as medicinal plant and is used on large scale in the manufacture of Ayurveda Medicines. National Medicinal Plant Board, govt. of India had recognized as a Medicinal and Aromatic Plant. This is endangered species too. Red Sandalwood Plant Species: Pterocarpus Santalinus Other Names: Red Sanders, Red Sandalwood, Ruby Wood, Hindi Names: Lal Chandan, Rakta Chandan Red Sanders (Hindi name - Lal Chandan or Raktachandan) is a light-demanding moderate sized tree growing upto 8 m tall with a trunk 50–150 cm diameter. It is fast-growing when young, reaching 5 m tall in three years even on degraded soils. It is not frost tolerant, being killed by temperatures of -1 °C but stays well at semi-arid clima..
Sandal Wood - Santalum Album Santalum album or Indian sandalwood is a small tropical tree, and is the most commonly known source of sandalwood. This species has historically been cultivated, processed and traded since ancient times. Certain cultures place great significance on its fragrant and medicinal qualities. The high value of the species has caused its past exploitation, to the point where the wild population is vulnerable to extinction. Indian sandalwood still commands high prices f..
Sandal Wood - Santalum AlbumSantalum album or Indian sandalwood is a small tropical tree, and is the most commonly known source of sandalwood. This species has historically been cultivated, processed and traded since ancient times. Certain cultures place great significance on its fragrant and medicinal qualities. The high value of the species has caused its past exploitation, to the point where the wild population is vulnerable to extinction. Indian sandalwood still commands high prices..